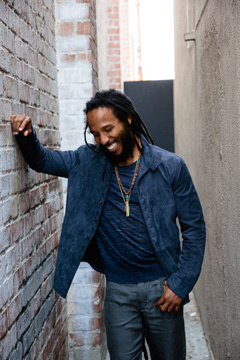 Ziggy Marley seems ageless, his positive energy boundless. The 45-year-old superstar of song collected his sixth Grammy Award this past winter, his In Concert set taking home best reggae album, has a new record, Fly Rasta, slated for release this month, and is prepping a return to the road for spring and summer tours that will take him to Europe and across America. Kicking off the promotion of the new CD, Marley and a partial semblance of his band- Takeshi Akimoto, guitar, Santa Davis, percussion, Rock Deadrick, percussion, and Tracy Hazzard, vocals- performed a short acoustic set on April 3rd for a gathering of celeb friends, VIPs, and lucky fans at Sonos Studio in Los Angeles. 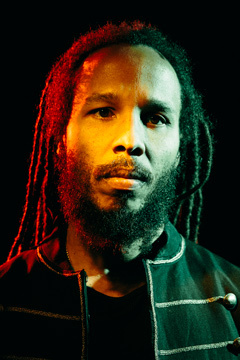 Congratulations on your recent Grammy for best reggae album. What does that award, or any award, mean to you? It’s not really me that wins the award. It’s the music, the musicians, and I am a part of that. It’s recognition for the musicianship, for the engineer, and the people that play on it. It’s recognition from some people for something they like. It’s positive, but a Grammy win is not something that will make you or break you. We want to make good music no matter what. You have to make good music! Your new album, Fly Rasta, seems to be taking you in a more diverse musical direction with elements of rock, funk, and folk. Plus you worked on this album with producer Dave Cooley and several musicians best known for work in the alternative rock scene. Is that an idea you’ve wanted to explore for a long time or more recently? More recently. You want to explore. You want excitement. You want to create new things. You want new. You want fresh. When I’m making music that’s what I want; the excitement of something new. It has creativity. It has inspiration. You’re expanding your mind. Was there something specific that said to you now is the time to do this? For years I’ve been searching, I’m still searching, for this sound. Every time on record I’ve tried to get closer to this thing, this thing that gets to the real purpose of music, the effect music can have on people. Besides from being entertainment. There is a fine art to it. I read a lot of books. I study. I kind of think about music on a higher level. I try and understand music more. For years I’ve been thinking about this type of sound that resonates beyond what we know today. We keep looking for that thing. This is just another way to try and see. I feel I’m getting closer, but still have a ways to go. How much closer did this get you? This is a big step, what I know of myself and what I want to do, where I want to go. It’s a good step for me. It opened my mind which is the most important thing. Are you less concerned at this point in your career with expectations or has that always been a part of you? That has always been a part of me. You made some choices on this record that don’t immediately evoke an association to reggae. Let’s take history; where did reggae come from? What was my father listening to? All music has every music in it. There is no music that is just by itself. It’s like the universe. What influenced reggae music? Radio stations out of New Orleans. James Brown. That is why my father’s music reaches a wide cross of people because, even if it was subliminal, it had things in it from another time, from another sound. Reggae has a father. It has a mother. It has a grandmother. Just like us. This is what this album is. It is making the point that reggae doesn’t have to do what it always does. It can be something that it is going to be. It can evolve. It can grow without losing reggae. If you dissect the music, you will find the root. It is always there. I feel like this album is your way of breaking down some of those labels, the desire to put music into categories. Yeah, you’re good. You’re good. On this record, you have reunited with the Melody Makers vocalists (sisters Cedella Marley and Sharon Marley, and singer Rica Newell). How was that and will there be more? I hope there is more. They kind of finished the record. It was like the record was unfinished until they sang on it. They are a really important part of that sound that we are talking about here today. Their sound is a very modern sound with historic feel, but they have their own sound that embellished the music and made everything fit together. What I know of John (Lennon) and Yoko, when she came into his life and the change; the good in John Lennon because of this relationship, the consciousness, the perspective, more open-mindedness. The song is about my wife. It’s a great name to sing, isn’t it? It fits melodically well. On that note, it sounds to me like you are really stretching your voice, your range on this record, from raspy to falsetto. We pushed up the keys on the songs. I took myself out of the comfort zone. This is the adventure. This is what we’re talking about. I put myself in a different place. On “So Many Rising,” I actually had to double-take. I wasn’t even sure it was you at first. I feel like there has been a transformation with you, and wonder if you feel the same. There are things happening. You’re right. All the things you said, that we’re talking about, these are things in my mind, that I’m supposed to do. I wrote down things before I made the record. This is one of my notes- Pushing not just reggae, but music forward. You see? That’s what I had in mind. You’re getting it, you know? Can you talk about where Rasta fits into life at this time? You have to know what the meaning is, what it means to me. To speak of Ras Tafari is not to speak of an organization or a church. It’s not like Christianity. I speak of Rasta from my individual experience and expression. The way I choose to express it to you is through love. That is the face of Ras Tafari. It is the face of love. I choose to express it through that image. When I say my prayers, when I do my spiritual thing, I say, ‘Jah, Ras Tafari.’ This is how I speak to him or to her or whatever you want to say that thing is. I speak to him in my personal life. The main thing is not the title- where Ras Tafari fits into life, or where Christianity fits, or where Islam fits. Where does love fit? This is the question. Love is the fundamental thing in my life. Has your involvement with interests outside of music, like the non-GMO movement, or the comic book, influenced the songwriting in any way? Mostly just people that I meet, experiencing life, experiencing different people. I went to Comic Con. I saw all these people dressed up. It was an experience. It was something that works in your subconscious. Your eyes have been opened to new things that you didn’t know or realize. The more I can open myself to more people, and be around different people, the more reflected it is in me as a person, and in the music. You are including a pack of wildflower seeds with each CD, which I took as a way of saying regardless of what side you’re on politically or otherwise, you just have to throw these things in the ground and something beautiful happens. I hope I’m on the right track in suggesting the record seems to be saying something similar, that change can come simply from within. When I finished the record I said to myself, ‘I don’t want to explain this too much.’ Just like you are getting what you are getting, I want everybody to get what they are getting. I don’t want to tell them what to get from it. The expression you get from it is what it is supposed to be. And now you’ll tour? A lot of the record will be part of the set? The live show is the next element. Just as I feel about the record, I need to feel about the live show. We love playing them live.